Brooklyn’s instrumental Post-Doom quartet CLOUDS TASTE SATANIC is set to release their fifth album on April 30, 2019 (Walpurgis Eve). 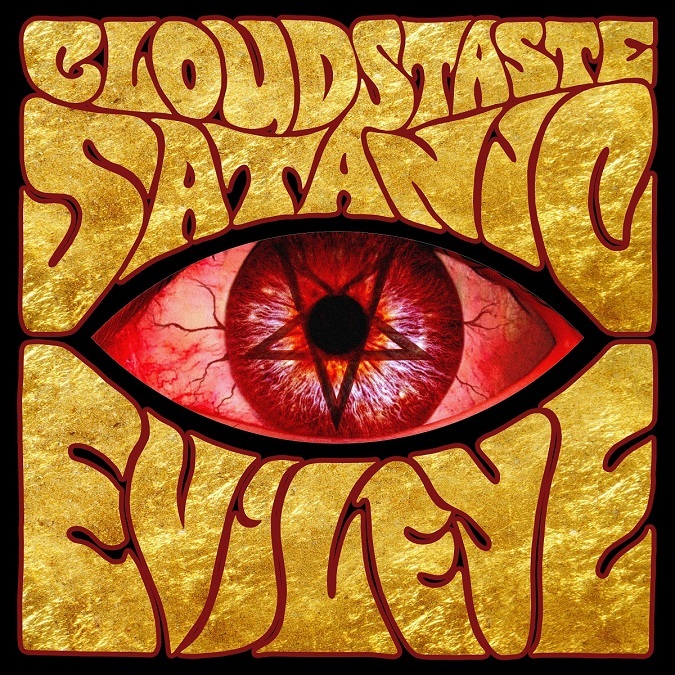 Entitled ‘Evil Eye‘, the new record features two 20-minute songs on two sides of vinyl and is the first of two CLOUDS TASTE SATANIC records coming out this year. The second album, ‘Second Sight‘, features two more 20-minute songs and will be released on October 31, 2019 (Halloween). Consider ‘Evil Eye‘ to be Part One of a two record set, which sees the band maintaining their “Riffs Rule All” credo, with an added dose of introspection by way of mixed tempos, spacy interludes, jazzy breaks, and epic finales. Each song is divided into three parts and explores the worlds of Lesser and Greater Magic, which were inspired by “The Theory and Practice of Satanic Magic” which is part of The Satanic Bible. Like its predecessor ‘The Glitter of Infinite Hell’ [read our review], the album recordings for ‘Evil Eye‘ were engineered and mixed by Ben Rice at Degraw Sound in Brooklyn, and mastered by Alan Douches (High On Fire, Converge, Mastodon) at West West Side Music. The cover and inner sleeve art are original pieces by Goatess Doomwych, whose work has graced numerous doom music covers and artwork posters, including albums by Dead Witches. Have a listen to the first track (essentially half the album), “Evil Eye,” streaming below. Certain pre-order options are available now at the band’s Bandcamp page [HERE]. – Test Pressings: 15 Copies made/11 for sale. Hand numbered w/Limited Edition sticker. Special Edition Jacket w/ original Goatess Doomwych cover art. Original Hand Silk-Screened in Blood Red & Metallic Gold by Made In Brooklyn Silkscreens. – “Weedpurgis Edition” Vinyl Package: 100pcs, (Weedpurgis… a “Joint” celebration of 420 Day and Walpurgis Eve) 12” Ultra-Clear Vinyl w/Exclusive Blood Red & Black Splatter. Matte Varnish Die-Cut Jacket designed by Goatess Doomwych w/Debossed Stamping & Hand Numbered, Ltd. Edition Sticker. Inner Sleeve/Record Labels contain more original GD art. Signed by band upon request. Each set comes with “Weedpurgis Edition” extras: 12”/16oz Custom CTS Slipmat w/original GD art; 6” Embroidered Patch; 5” Color Promo Postcard w/the story behind Evil Eye; CTS Est. 2013 Sticker. – Limited Edition Vinyl: 100pcs, 12” Gold & Blood Red A-Side/B-Side Vinyl w/ White/Black Splatter. Matte Varnish Die-Cut Jacket w/Debossed Stamping. Inner Sleeve/Record Labels contain more original GD art. – Limited Edition Vinyl: 100pcs, 12” Blood Red Vinyl w/ Gold/White/Black Splatter. Matte Varnish Die-Cut Jacket w/Debossed Stamping. Inner Sleeve/Record Labels contain more original GD art. – Limited Edition Compact Disc: 125pcs, Jewel Case, 4 Panel Insert, Outer/Inner Tray Art Exclusive to the CD.